From left: Serafin U. Mariel, President and CEO, New Yrok National Bank; Paula E. Graves, program manager, Minority Business Executive Programs, Dartmouth's Tuck School of Business; Dave Norton, Executive Vice President, HR Corporate, Starwood Hotels and Resorts Worldwide Inc.; Anne Stilwell, Director, Strategic Sourcing and Procurement, Fannie Mae; Nancy Carin, Executive Director, Business Outreach Center Network Inc.; Jesus F. Linares, CEO, Business Relocation Services Inc.; Gregory L. Reid. 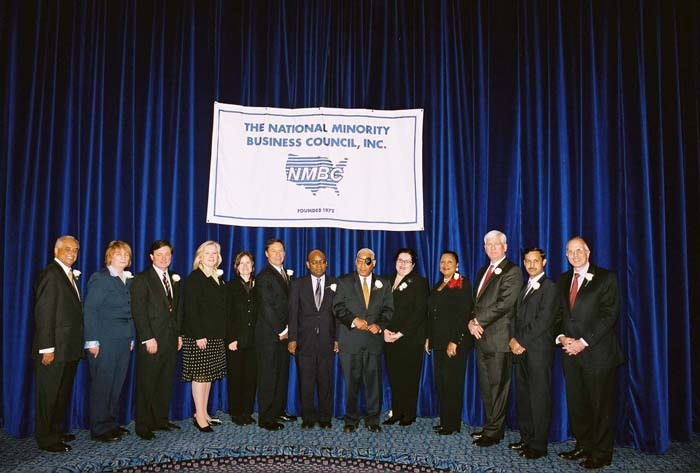 Esq., NMBC board chairman; John F. Robinson, NMBC President and CEO; Cathy A. Martino,President, Furniture Advisors Inc.; Johnnie B. Booker, Director, supplier diversity, The Coca-Cola Co.; Donald R. Monks; Sr. Executive Vice President, The Bank of New York, Luncheon Chair and keynote speaker; Nirmal Goswamy, Neotecra Inc.; and Michael J. Critelli, Chairman and CEO, Pitney Bowes Inc.
Neotecra was chosen as the “GMS Alliance Supplier of the Quarter” for KeySpan. Neotecra have been chosen as the "GMS Alliance Supplier of the Quarter" for KeySpan. At the conclusion of each quarter the GMS team gathers to analyze and discuss which supplier has exemplified the greatest qualities of success and compliance in our program. For Q4 of 2006 we are pleased to present this award to Neotecra Inc.